I was recently invited to give a keynote address at the Human Disease Mapping conference at the Royal College of Surgeons in Ireland that was fully coordinated by a small group of the college’s PhD students and postdoctoral fellows. The scope was to share my experience and story of my academic career in a period where the global financial and humanitarian crisis is affecting young scientists’ hopes of doing what they love most – science. Given its length, I have divided the original talk into multiple posts. Creating options for yourself is important because even if you have a stellar CV, a supportive and connected mentor, and a long history of successful grantsmanship, including current funding; there still may not be a faculty position available for you when you are ready to leave. It’s hard to come by stats, but for the five faculty interviews I’ve been on there were nearly 250 applicants for each – every one of them as smart, capable, and driven as myself. 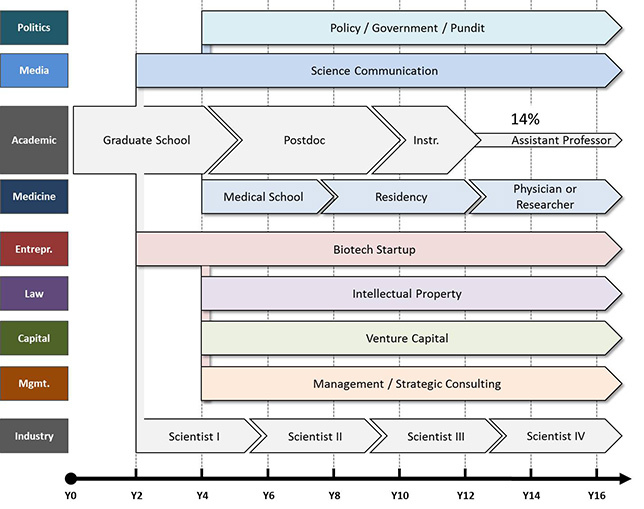 Most biomedical departments, if they are hiring (a process which is increasingly sporadic, as senior faculty remain at their posts for longer) will open up one or two positions in the fall, and once filled, will not consider future candidates for another 5+ years. There is a very narrow window here, and the fit may not be there for you. Alternatively, and I have seen a lot of this recently, after making it through the selection process and into your 2nd and 3rd interview, you realize that the department is only able to provide you with a fraction of what you need to get going, and you are expected to make up the difference yourself. While anticipated to some degree, an over-reliance on external support to maintain your lab is increasingly risky given the current funding climate, and may still not be enough to see you through. What then? Do you turn the offer down, knowing it may be your only way out of a postdoc, or accept a research position that you may be forced to leave in three years if funding dries up? Also consider that none of this is happening in a vacuum. Stay with me – it’s about to get dark. At this stage most of us are in our early 30s, married or with a long-term partner, and increasingly wanting to settle down, improve our standard of living, and start a family – none of which seems possible with a $40K/year salary and student debt. The lack of career advancement, uncertainty of employment, and transitory nature of your last 10 years begin to take their psychological toll – it eventually happens to all of us. Crushing despair gives way to strong feelings of abandonment, disillusionment, and lack of self-worth. What you need is not to be told that everything will work itself out, as I’ve heard so many times in the past; what you need are concrete options. In graduate school and through our post-doc we are taught, falsely, that there are only ever two: Academia or Industry. Why there should only be these two is beyond me, but few of us ever consider a 3rd, or 4th, or 5th… We are also taught that once you leave academia, there is no going back, and that this is a one-way road. This is also absolutely false. For starters, a very proximal option, and arguably the smarter one for those of us wanting to become academic faculty, is medicine. There is a dire need for physicians with a strong grasp of the literature, logical reasoning and critical problem solving that is taught in graduate school. Medical school and residency combined are no longer than a post-doc and instructorship; subsequent employment is all but guaranteed, and this career path offers the best possible job security available and a significantly better salary. Moreover, you have the freedom following your residency, to become a researcher and do the exact same job you had intended, or dedicate yourself to seeing patients, if you find you prefer this. When grants dry up, as they will, you can take on a greater patient load to make up the difference in your salary, and will rarely need to worry about having to shut your lab down entirely. My wife made this transition following her PhD in inorganic chemistry five years ago, and found she prefers the human interaction and immediate sense of value she derives from helping patients directly, and is the happiest she’s ever been for it. In the interest of brevity, I have divided my continued discussion of individual career trajectories into two subsequent posts: entrepreneurship, and media/politics. Given how much research scientists already know about industry, this will not be discussed at present –- although I will be posting a dedicated series on that academic career trajectory in the near future. Excellent! Thanks, excited about the next posts. You hardly need to alert science students to the possibilities of medicine. Given the undergrads to whom I teach organic chemistry each year, I’d say quite the contrary. A colleague of mine asked his class “when do you plan to write the MCAT” and 95% of them responded “sometime within the next 3 years”. In short, the main reason our students are taking science is as a gateway to what they perceive as high-paying, high-prestige and high-relevance careers as MDs. Even though the odds of becoming a professor of organic chemistry are slim, I’d suggest that we let students find medicine for themselves, and concentrate on reminding some of them that science is beautiful and valuable in and of itself, not simply as a gateway subject to medicine.